Kingfisher plc, the owner of DIY retailer, B&Q is considering the future of the Rotherham store, which only opened in 2009. Under plans to "transform its offer" to customers, the nearby store at Darnall in Sheffield is closing and the store at Cortonwood in Rotherham is to remain open. 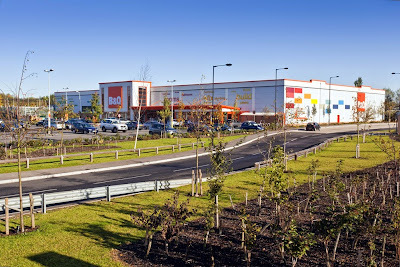 The mini-warehouse is part of the £6m Northfields Retail Park developed by Henry Boot on brownfield land close to the established Parkgate Shopping retail park. The retailer moved from previous premises at Thornhill. A new chief executive of Kingfisher announced last year that, as part of plans to counteract a slowdown in the DIY market, B&Q intended to close around 15% surplus space (65 stores) by the end of the 2016/17 financial year. A move which put 3,000 jobs at risk. Reporting its financial results for the year ended 31 January 2016, the company said that: "the first 30 B&Q closures took place during the year as planned, mostly in Q4. Of the 65 stores, exits of 40 leases have been secured through a combination of transfers to national retailers and lease expiries. Discussions are ongoing on the remaining stores. Sales transference to date supports the one third required in the business case for the closures. Closures in FY 2016/17 are expected to be more evenly phased across the year." It added that: "We know that in the UK & Ireland we can adequately meet local customer needs from fewer stores, so the closures are prioritised by the most over-spaced catchments, in order to retain customers and sales." At the same time, Kingfisher has opened 60 Screwfix stores. A spokesperson for B&Q said: "We can confirm that our Sheffield Darnall store will close in April 2016. We will endeavour to find alternative positions for as many staff as possible. "We can confirm that staff at our Rotherham Parkgate store are aware that we are considering the future of their store as part of changes to the B&Q estate across the UK. Our Dearne Valley store is not proposed for closure." The 51,000 sq ft retail warehouse unit at Northfields was purchased in 2014 by IPT Property Holdings Limited, a subsidiary of FCRE, for £10.5m, at an initial yield of 7.3 per cent. The unit is let until August 2029, with a tenant's break in 2024, at £810,346 per annum. Full-year retail profits for Kingfisher rose 18% to £326m for the year ended 31 January 2016. At its B&Q business total sales were up 1.1% to £3.8bn. Its "Click, Pay & Collect" scheme is now available on over 16,700 products and total online sales, including home delivery, grew by 29% for the year. You will now have to go for a screw to Sheffield ! Wickes has had a refit now sure they will mop up all the trade.